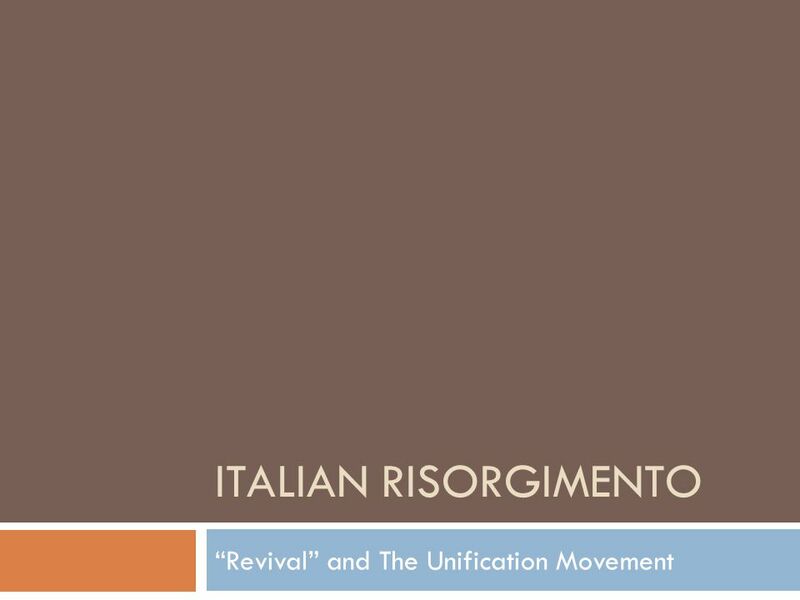 ITALIAN RISORGIMENTO “Revival” and The Unification Movement. 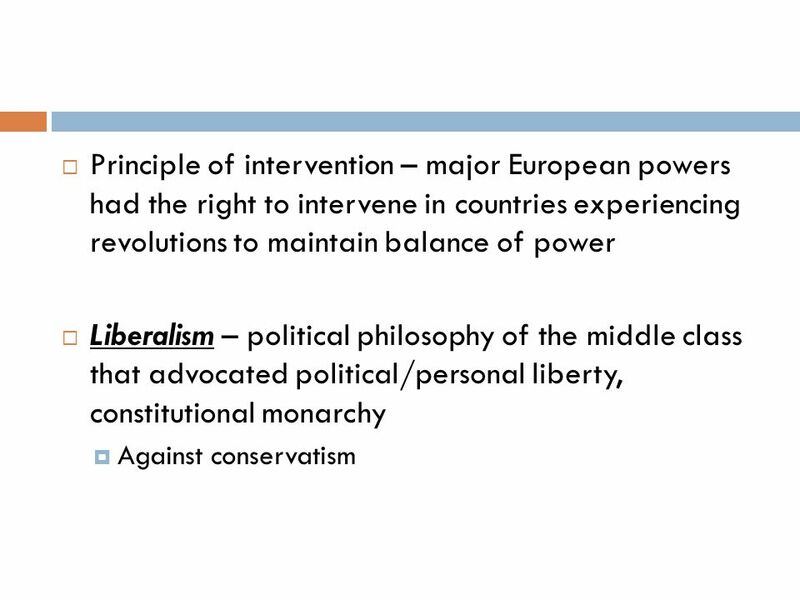 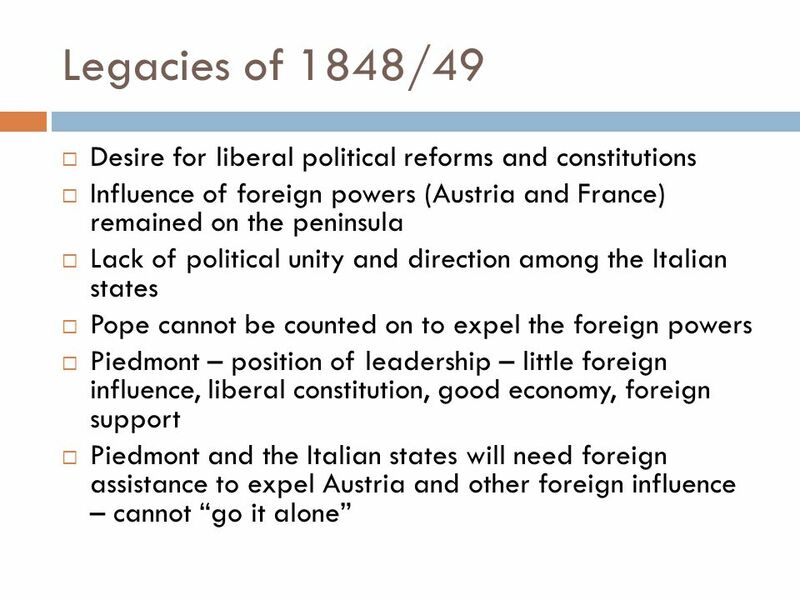 Download ppt "ITALIAN RISORGIMENTO “Revival” and The Unification Movement." 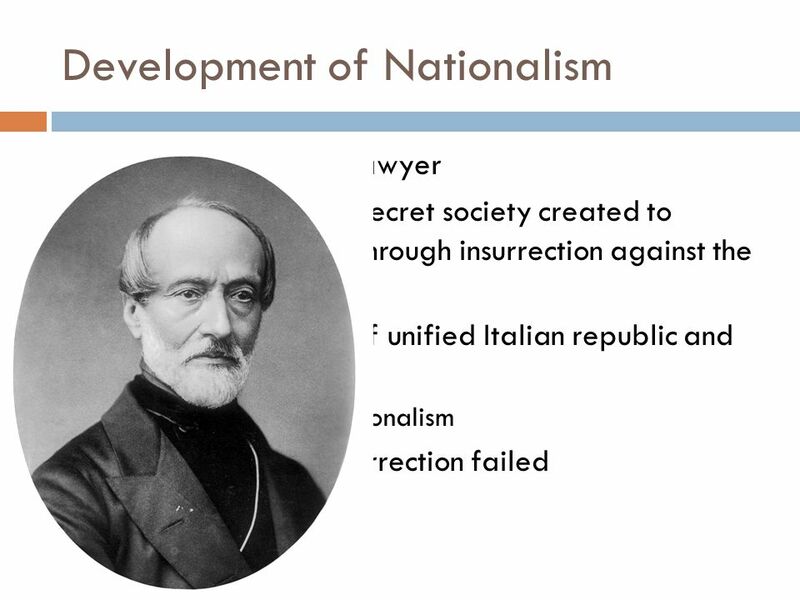 ITALIAN NATIONALISM and the creation of united ITALY. 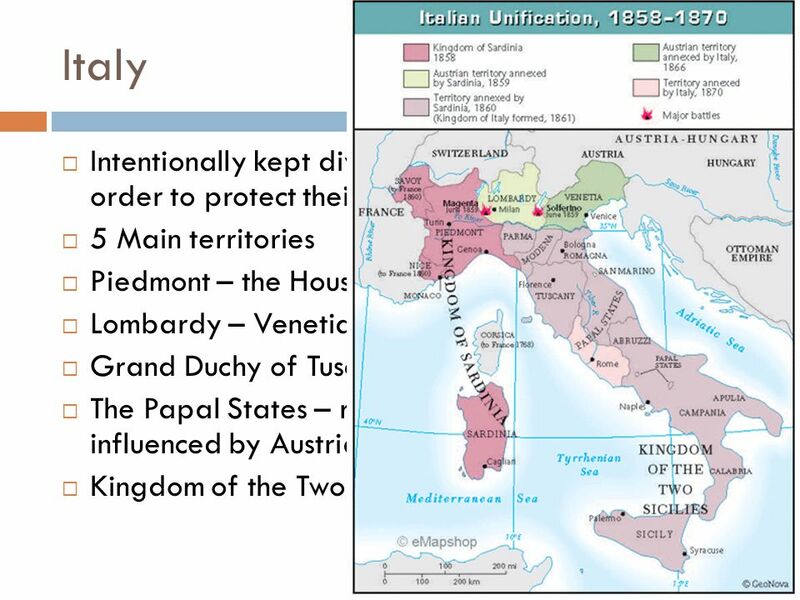 Unification of Italy The Risorgimento Mr. D.. Obstacles to Italian Unity The Congress of Vienna (1815) had used the “balance of powers” principle Austria. 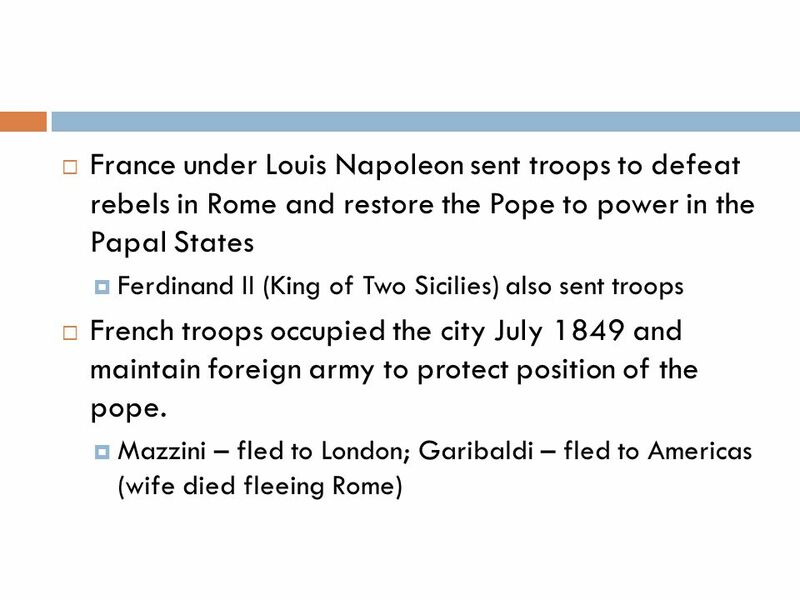 WORLD HISTORY/CULTURES CHAPTER 15 - Reaction & Nationalism SECTION 1- THE UNIFICATION OF ITALY. 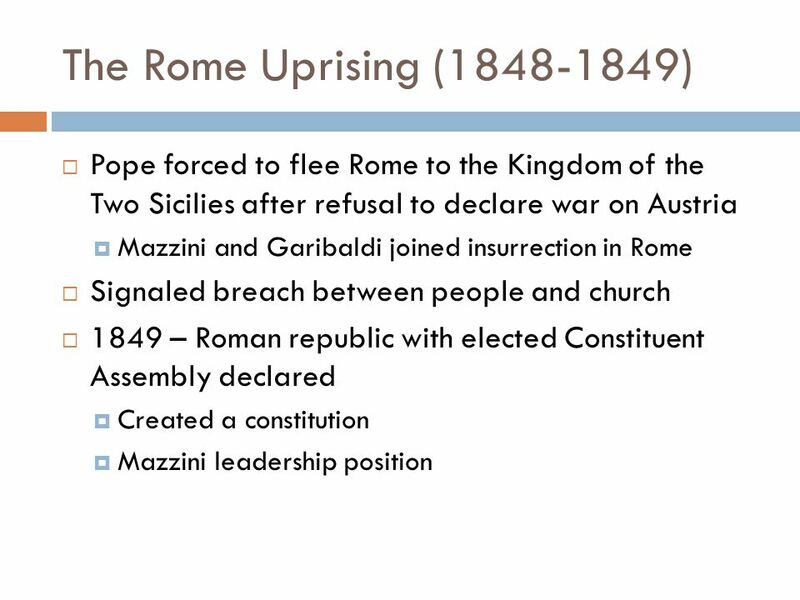 The Italian Unification or Italian Risorgimento is known as the chain of political and military events that produced a united Italian peninsula under. 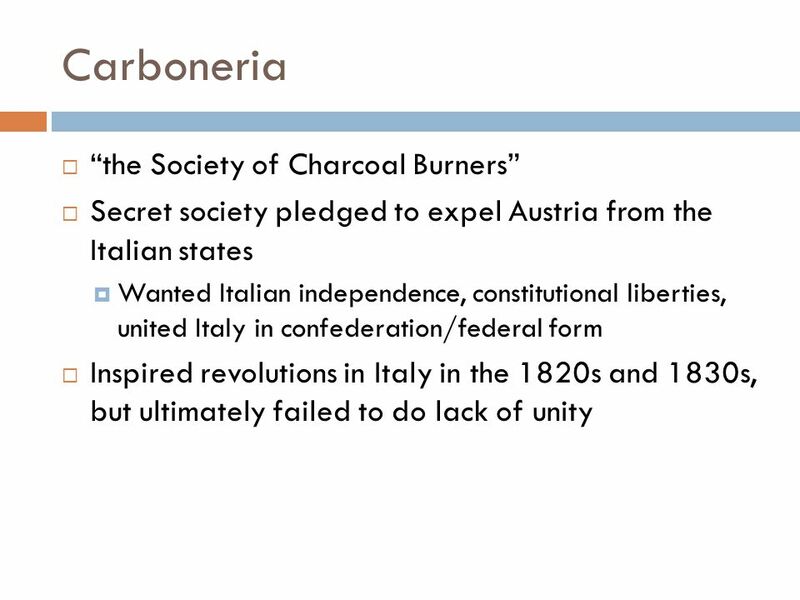 The Unification of Italy A desire for national independence A desire for national independence. 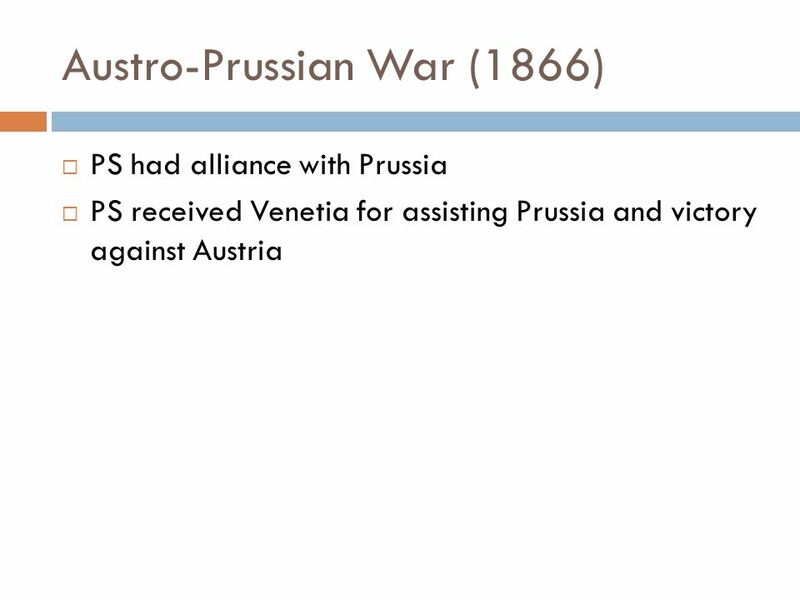 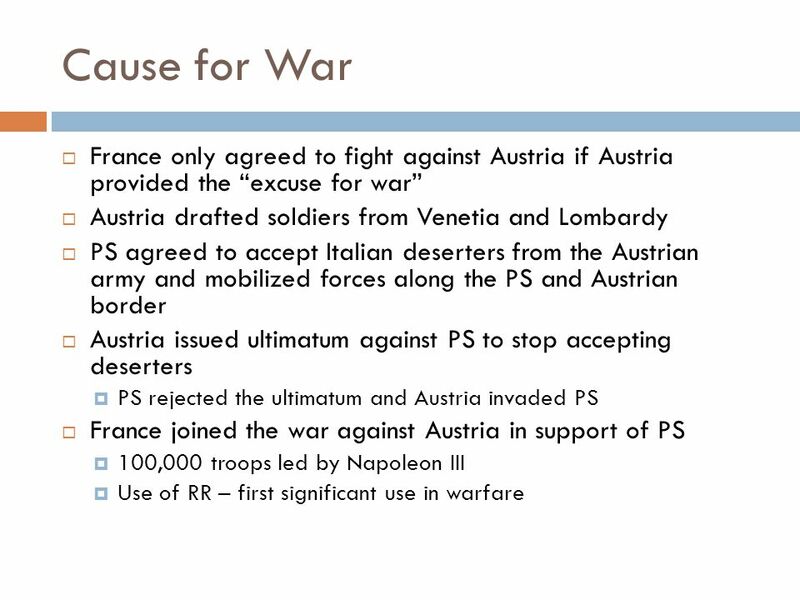 Congress of Vienna and the Unification of Italy. 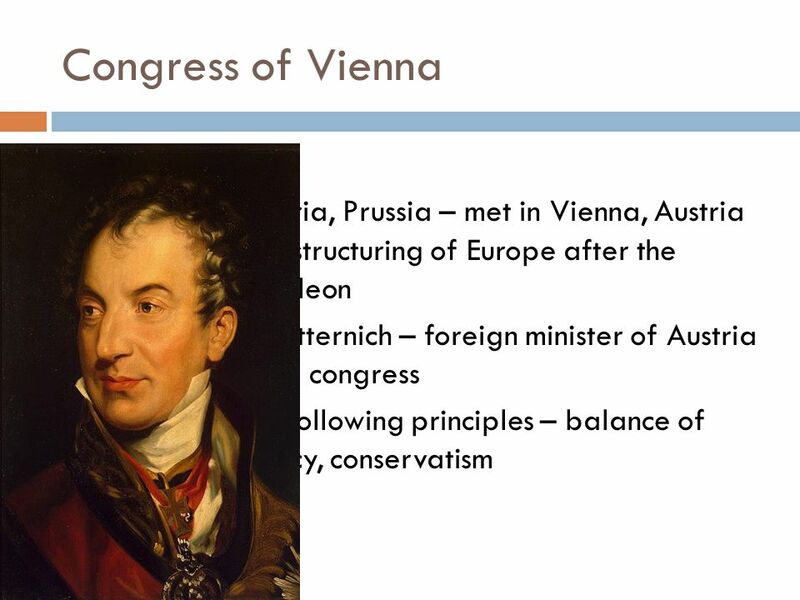 Congress of Vienna A meeting of Royalty held in Vienna, Austria. 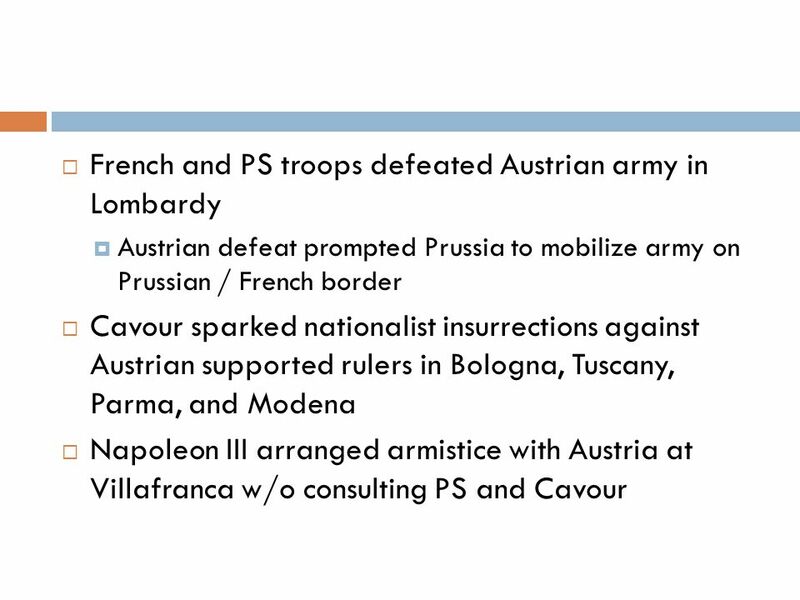 September 1814 through June 1815 The. 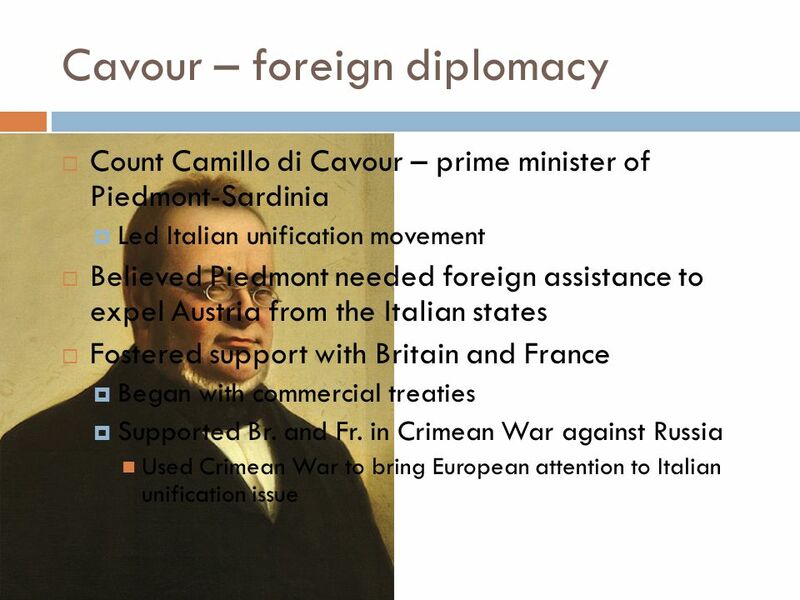 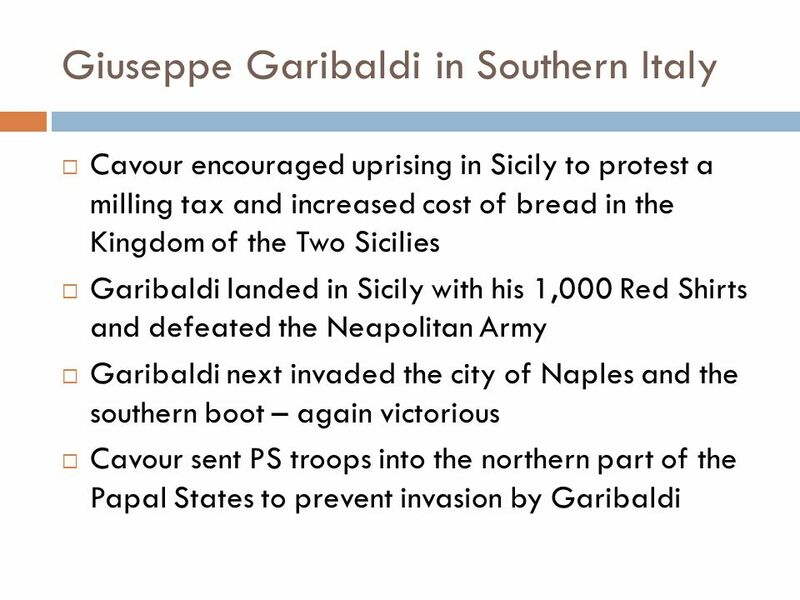 Revision – Session 1 The Unification of Italy. 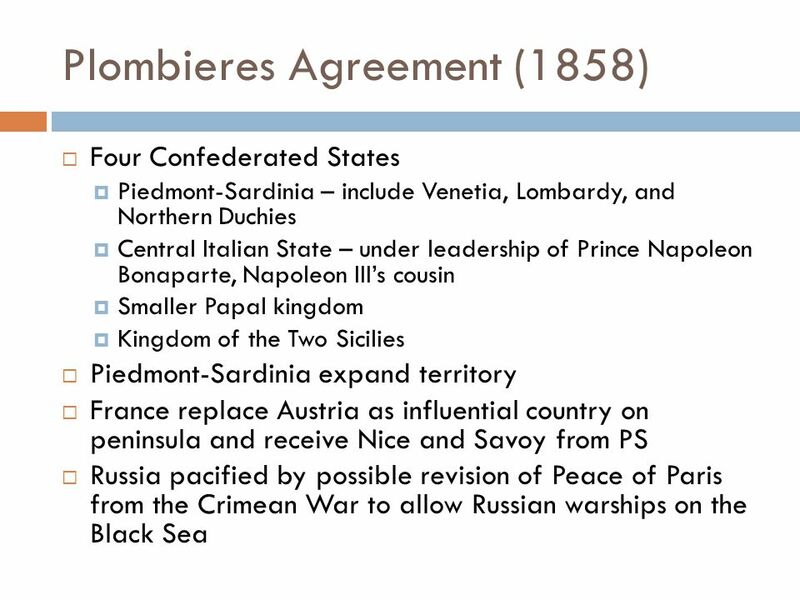 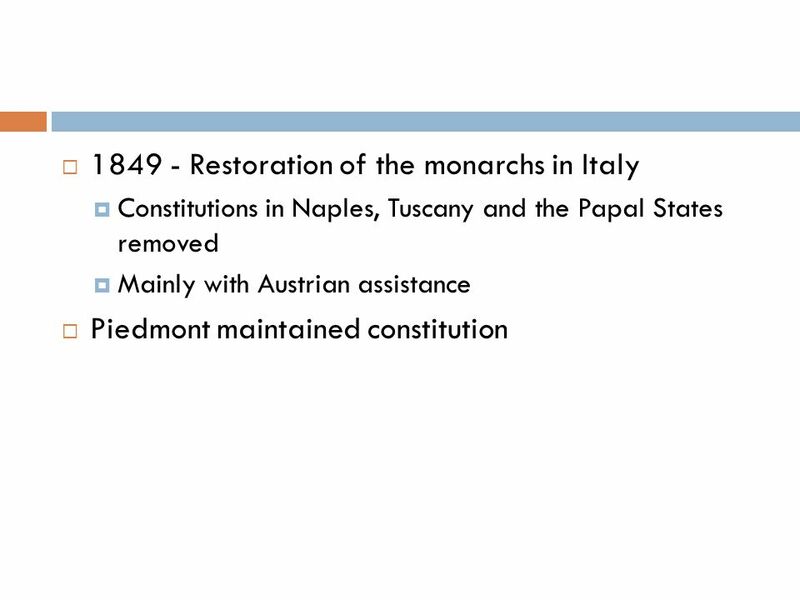 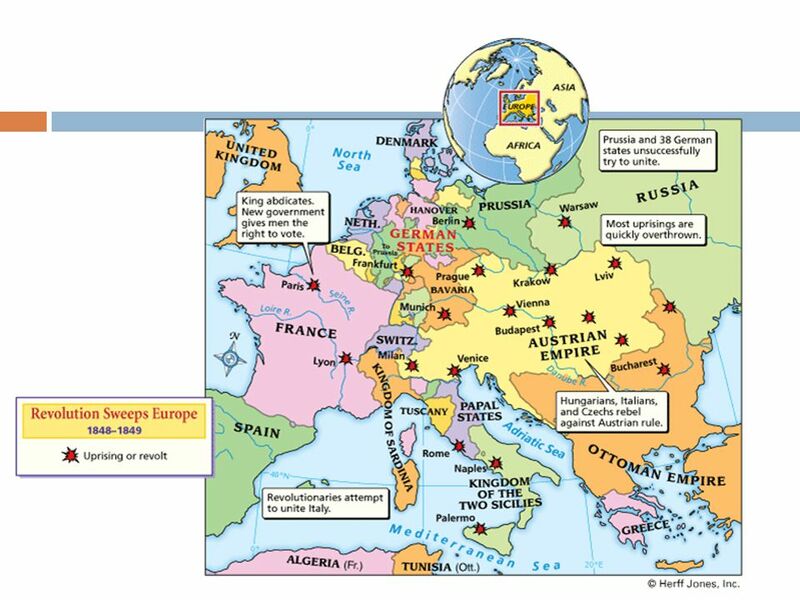 Italy  Treaty of Vienna 1815 Italy divided into 4 main areas  Naples  Papal States  Austrian. 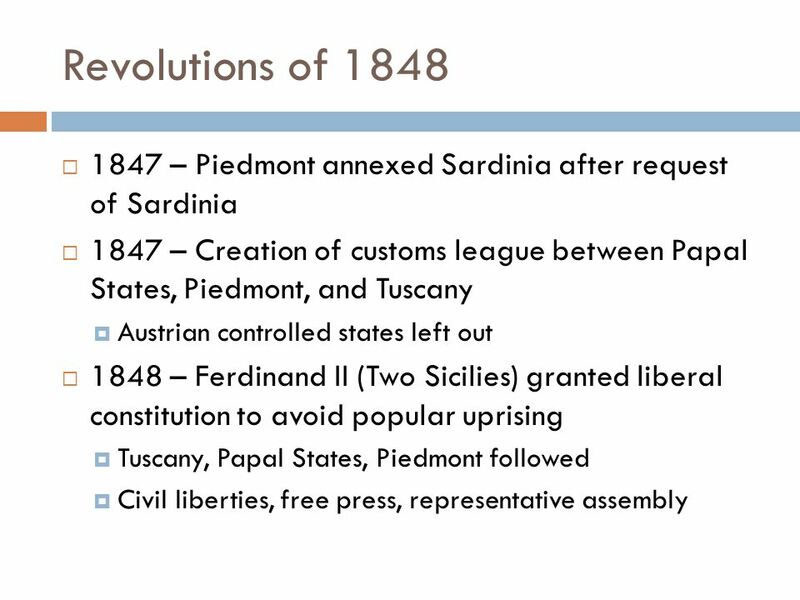 The Revolutions of Sicily and Naples [January] Tuscany [February] Piedmont [March] Papal States [March] Lombardy & Venetia [March] Political. 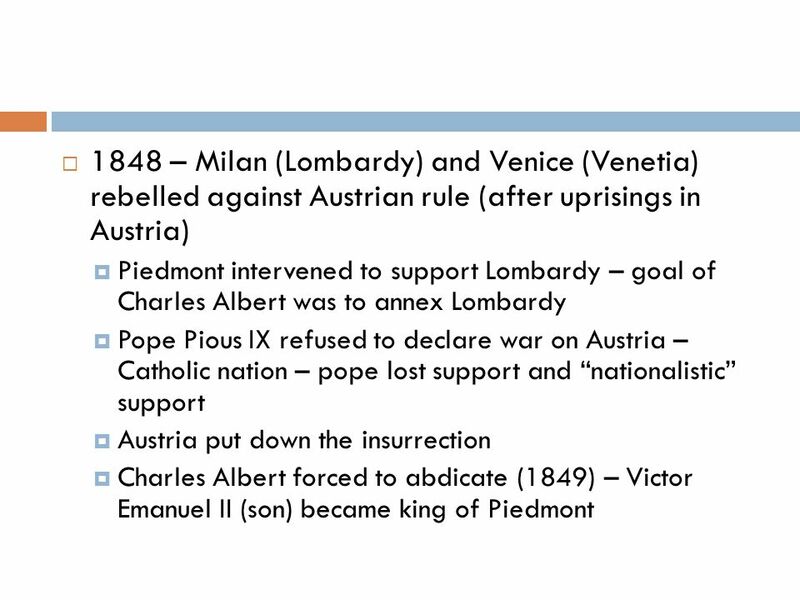 Italian Unification Chapter 23. 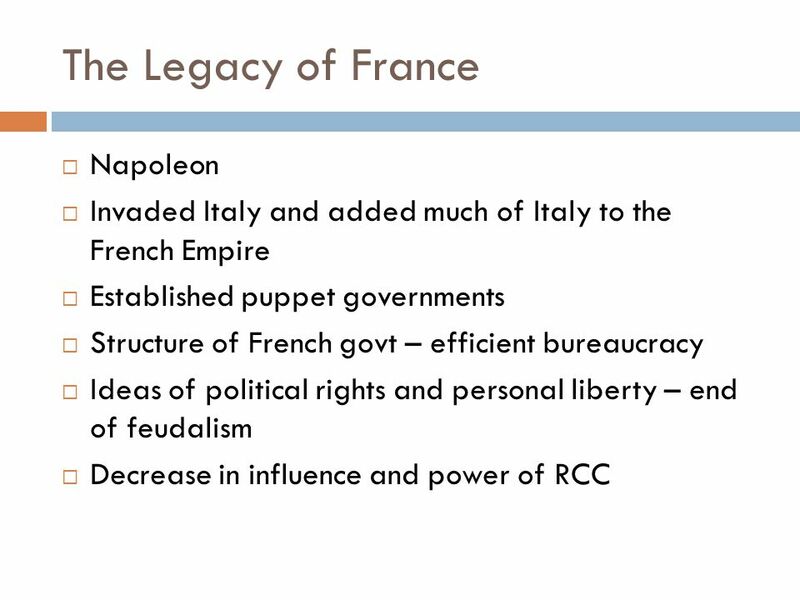 Background The “Long Century” – – French Revolution/Napoleon ( ) – Age of Metternich ( ) – Age. 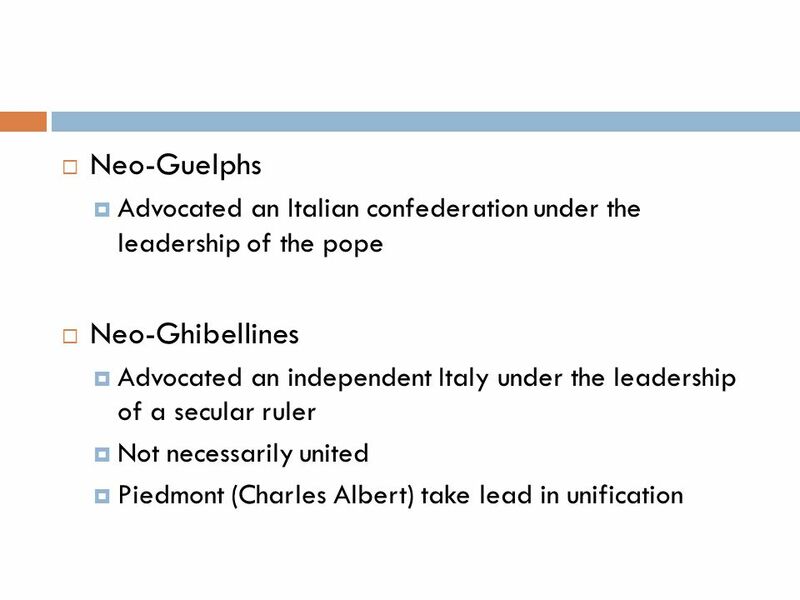 Italian Unification February 2 nd, Politique What does it mean to be a politique? 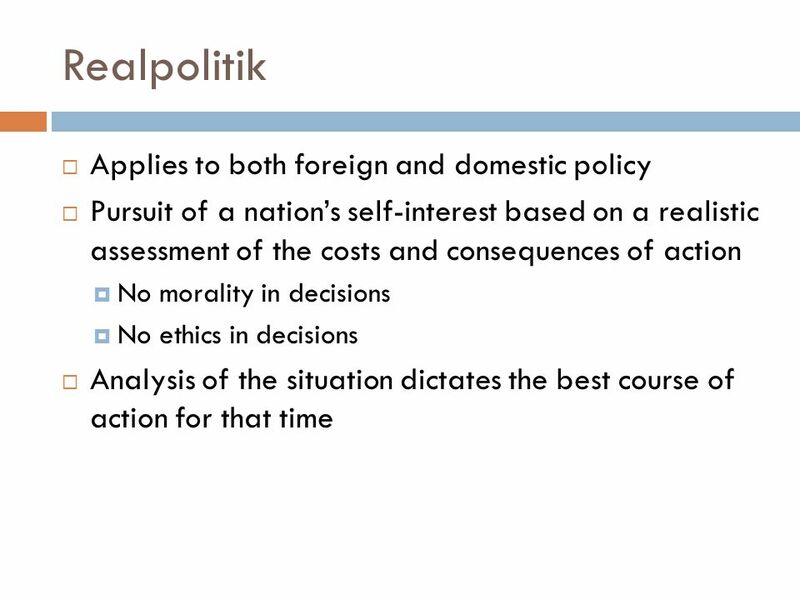 What does it mean to be a politique? 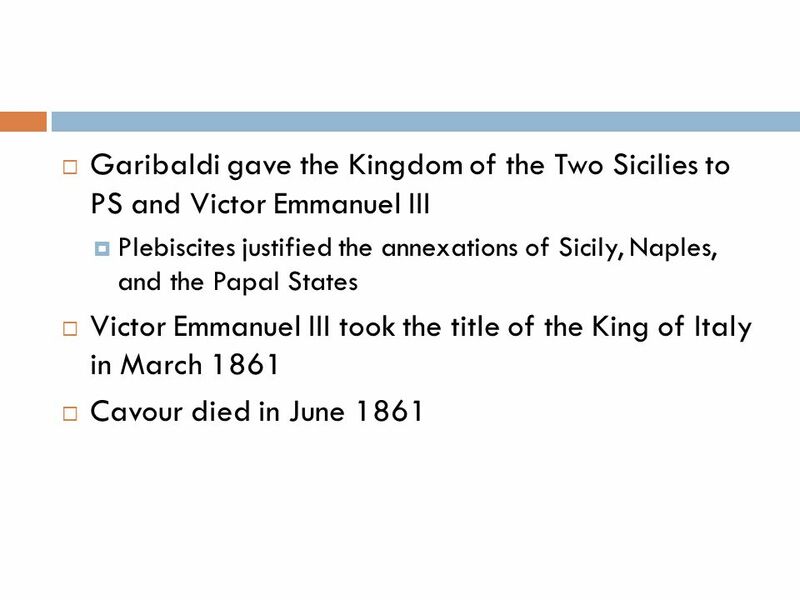 We’ve identified 2 successful. 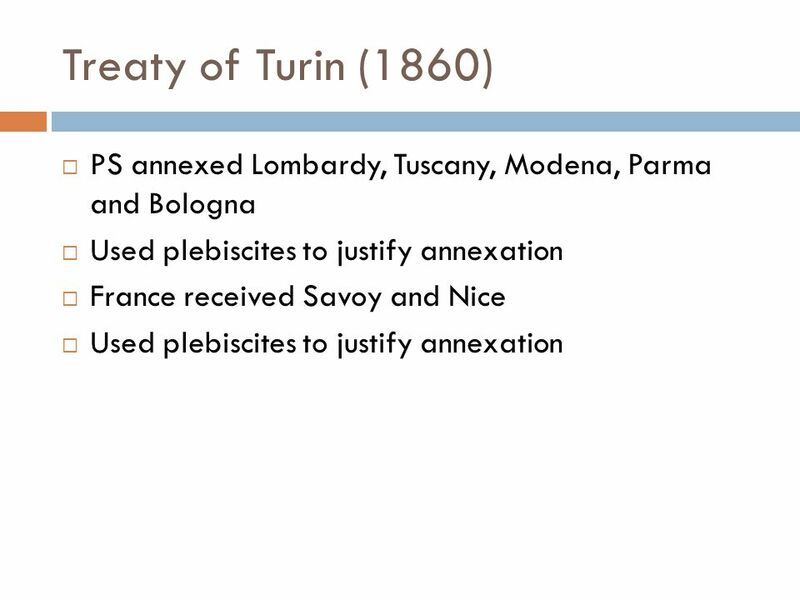 A brief introduction to the birth of the Italian State. 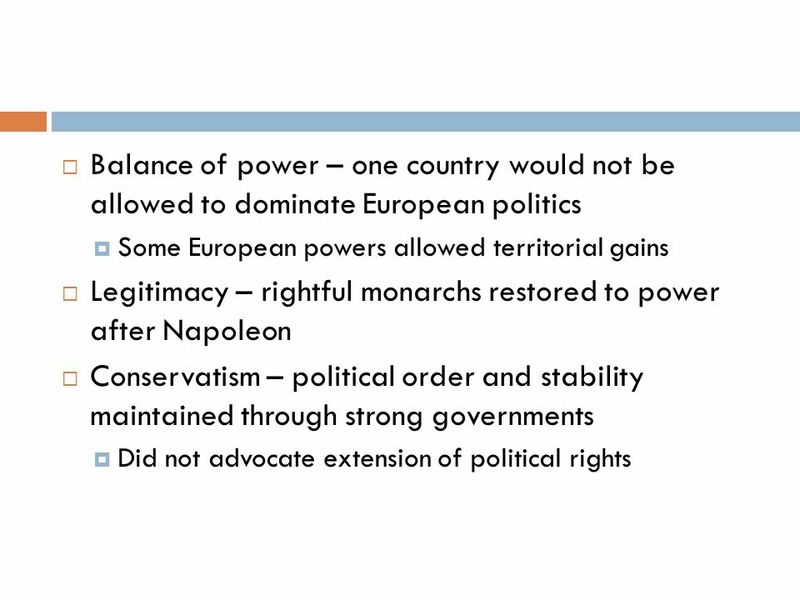 After the fall of Napoleon, the Congress of Vienna established a balance of power in Europe between Great Britain, France, Russia and Austria in 1815. 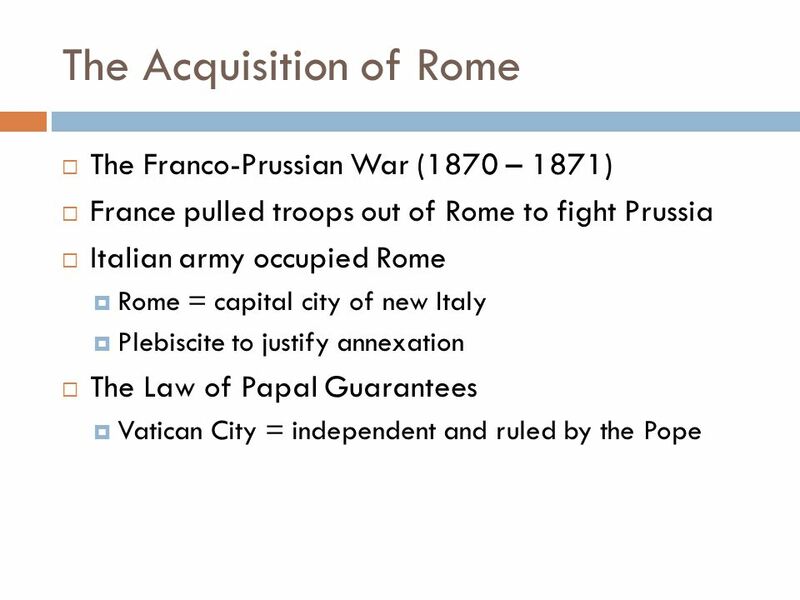 NATIONALISM IN EUROPE CHAPTER 24, PG ITALIAN UNIFICATION Fall of the Roman Empire: Italian Peninsula no longer unified Most people spoke the. 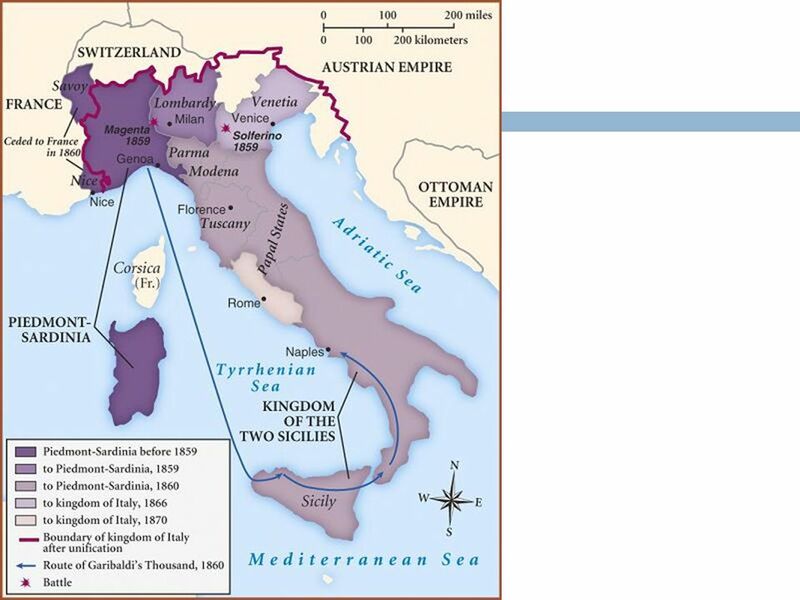 Roman Empire 1000BC up to 500AD Italy was intact for nearly 1500 years. 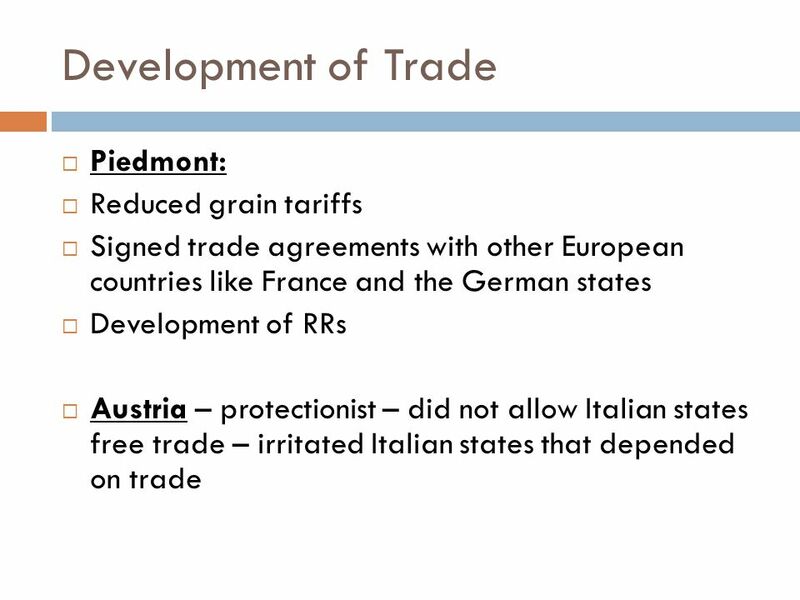 It was under the influence of the Romans and Etruscans starting around 1000 B.C.